Proper adjustment of the headlight beams is of vital importance for your safety and comfort and also for the other road users. It is also a specific regulation of the road traffic code. To ensure you and other drivers have the best visibility conditions when travelling with the headlights on, the headlights must be set properly. Contact Fiat Dealership to have the headlights properly adjusted. Check beam aiming every time the load carried changes. The car is fitted with electric headlight slant adjusting device working with ignition key to MAR and dipped beams on. When the car is loaded, it slopes backwards. This means that the headlight beam rises. In this case, it is necessary to return it to the correct position. hold button (A) pressed to decrease by one position (e.g. : 3 → 2,2 → 1,1 → 0). Each position increase corresponds to a beam slant lowering (laden car). Position 0 - one or two people occupying the front seats. Position 1 - five people. Position 2 - five people + load in the boot. Position 3 - driver + maximum permissible load stowed in the boot. IMPORTANT Check beam aiming every time the load carried changes. The dipped beam headlights are adjusted for circulation in the country in which the vehicle is marketed. In countries with opposite circulation, to avoid glaring oncoming vehicles it is necessary to cover the areas of the headlight as shown below; this is done using non-transparent sticker tape. 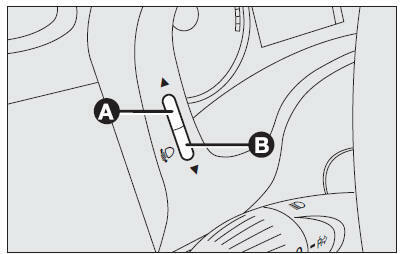 Figures refer to passing from right-hand drive to left-hand drive.